The Acti-Flex and Flex-It by Cox Vet Lab offer results we fully stand behind with our full MONEY-BACK GUARANTEE! 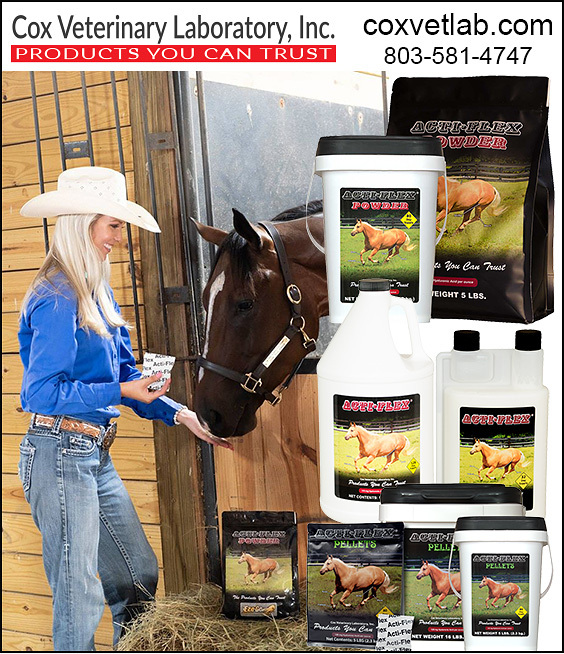 We use these amazing products on our own horses with outstanding results! What Joint Support Products Does Cox Vet Lab Offer My Horses? We have 3 great products that are truly amazing. Superior quality ingredients all designed with the right amount of ingredients to provide consistent results to help your horse on the way back to healthy and comfortable joints. Acti-Flex Senior: Offers full Joint Health with Omega 3’s, Probiotics and Manganese for energy and chelation ! Other than these amazing additions, it contains everything that Acti-Flex does as shown above. You’ll love the difference it makes to your horses. Flex-It: Comes in a convenient 6 dose syringe for convenience. With 5000 mg of the Glucosamine Sulfate (shellfish) and 750 mg of Chondroitin and 500 mg of MSM— along with 200 mg of Hyaluronic Acid. This is perfect for horses that just need a little extra support during workout periods or that may be just starting to put extra stress on joints. Flex-It is an amazing product with a pleasant apple flavor your horse will love. What Do Horse Owners Say About Acti-Flex? Where Can I Buy Acti-Flex and Flex-It By Cox Vet Labs?